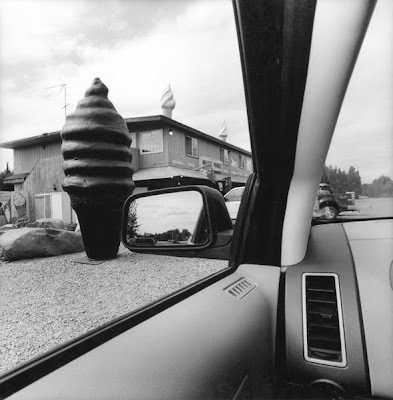 Generally, I have not been a big fan of Lee Friedlander's work since the 1970's. Being aware that many artists and photographers rest on their laurels and continue to do the same thing over and over again - I commend Mr. Friedlander who has consistently explored new points of view and themes in his work. Unfortunately the evolution from master street photogragher to nature photographer of stems, twigs, sticks and branches never suited my tastes. So it was with some skepticism and an open mind that I attended the Lee Freedlander show America by Car at the Whitney Museum of Art last month. Having heard that the new work was to be all images of America from his car window I was curious to see the show. As you may know, I myself make at least one major road trip a year to do some serious shooting across the United States. I felt that is was necessary to see what Lee Friedlander was up to on his own journeys. I found to my disappointment a tedious and unrestrained edit of dozens and dozens of images. Photographs of mostly cliched images of the American Road. I was hoping for something deeper, something that did not just scratch the surface about the America at the turn of the twenty first century. What I got instead was an overly studied typology (identically framed photographs always looking through the car window with the window/dash/door frame intersecting the image) that had nothing really special to say. After I saw the first five I was already quite bored and had the feeling I could probably have stopped right there and had a complete and total experience of the work. I should point out that Friedlander suffers from arthritis and is largely housebound (according to wikipedia) - so I commend him getting out and doing what he was physically capable of doing. That said however, I just don't think that I should give the work a pass solely because of his physical condition. I know this work has its defenders and feel free to argue here as to the value of this work. I also rarely ever post criticism on this blog but I felt inspired to say something. I can say that I was definitely impressed with how clean the window glass was in every single image!